Marinate the chicken pieces with the ingredients given under marination for 30 minutes. Heat oil in pan and add wholespices and saute.To this add sliced onions and grated carrot and saute till cooked then add ginger garlic paste and saute.Now add tomato puree and tomato saute and add turmeric powder chilly powder and coriander powder and cook till oil seperates.To this add the marinated chicken pieces and water(2cups) and required salt.Cover and cook for 15 to 20 minutes. Once cooked remove the chicken pieces and keep aside.Now add more water required as per rice quantity (i had 1 cup of stock left in pan so added 3 cups of water more as 4 cups of water was needed for 2 cups of rice) to the remaining stock in pan and add saffron and lime wedges.Add the washed and drained rice to this and adjust salt. Let it cook.Meanwhile toss the cooked chicken pieces on pan with a drop of oil or bake them in oven for 10 minutes flipping sides at 180c till golden brown. Once the rice is cooked remove the lemon wedges. Serve hot with chicken pieces. You can garnish with boiled eggs or raisins nuts etc. 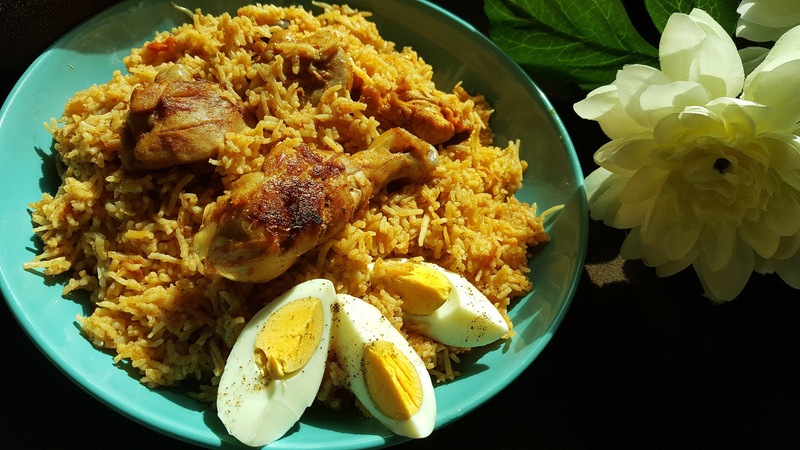 Your yummy kabsa chicken rice is ready.